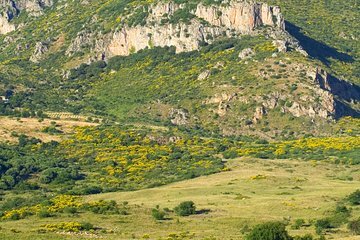 Visitate il Parco Naturale Regionale delle Madonie in Sicilia in una gita di un giorno da Cefalù e passate dalla metropoli costiera alle montagne in un giorno. Il viaggio verso il nord dell'isola comprende villaggi di epoca medievale e una fattoria attiva, oltre alle verdeggianti colline delle Madonie. Goditi una degustazione di ricotta fresca presso l'agriturismo e gusta un pranzo tradizionale all'aperto prima di tornare a Cefalù. Most of the day was spent on the bus with some stops only allowing 10 mins to look. We drove a long way to look at a fountain which was pointless. My friend and I were the only English speaking guests and felt as though we were only getting half the info and lunch was basic and rushed. This was an amazing tour! We had Mario as our tour guide, and you could see how passionate he was about sharing history and information about the areas we visited in Sicily. He spoke in English, Italian, and French during the tour to accommodate everyone in our group. We stopped in several small villages including Castelbuono, Petralia Soprana, and the highlight was definitely visiting the farm where the ricotta cheese is made. We had the opportunity to taste warm ricotta, with red wine, and some other local cheeses. Lunch was at an agriturismo site. An amazing day! Definitely a highlight of my trip to Sicily, and Italy! Unfortunately this tour did not take place on the day booked, but I was offered an alternate excursion to the Lipari Islands and Vulcano, since I would not have been able to take this tour on another day. The Lipari Islands excursion was a great substitute, enjoying a day out at sea and discovering very picturesque volcanic islands. Tour guide Mario did an excellent job of explaining geology, history and mythology with a touch of humour. The Sicilian Countryside Day Trip has been shifted to Thursdays.